Plugin Registration tool’s profiling functionality has made plugin debugging a lot easier. The ease of use can sometimes tempt you to use this feature in the early stages of plugin development, to analyse what is state of PluginExecutionContext, InputParameter, Pre/Post Images etc. This gives you an understanding of the plugin’s flow and state, but only after it has been deployed to CRM. This, however, is not unit testing. It is a unit testing framework, that can be used to do isolation testing using Shims and Stubs. You are developing a plugin which prevents the user from creating more than one opportunity for a customer. /// primary entity's attributes before the core platform operation executes. /// Initializes a new instance of the <see cref="PreOpportunityPlugin"/> class. Where can I find more information about Microsoft Fakes? This just barely scratches the surface of what is possible. 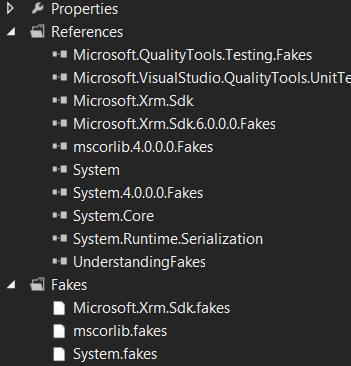 Please explore the codeplex site to know more about how you can utilise Fakes in your CRM Development. EDIT (01/12/16): Use FakeXrmEasy or XrmUnitTest in your unit tests. Both the frameworks can do integration testing as well.